I got bangs! Well, off the internet. About three years ago I had Zooey Deschanel-esque bangs that I loved (seen here). The only problem was they were a lot of work and were not exactly great for traveling (bangs require constant trims and styling). I have wanted to recut them for a while now, but my better judgement has kept me from taking the plunge. Just when I had given up hope of reviving my bangs, I came across these great clip-in bangs. It is the best of both worlds, all of the great style, none of the commitment! I would suggest, however, that you have your stylist trim and blend the bangs for a more natural look. As much as I love the bangs, this dress is my favorite part of this look. It is just a little but retro while still looking fresh and modern. Not to mention it is very comfortable. 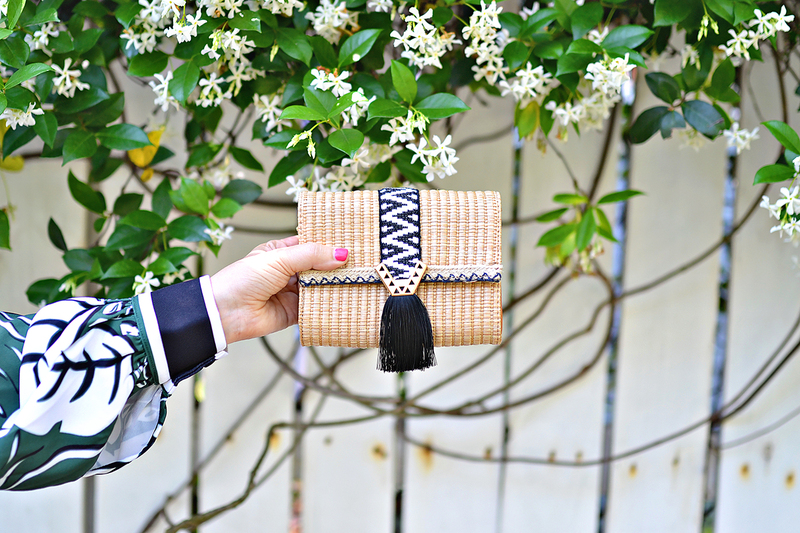 I topped it with my latest hat obsession, this Lack of Color straw hat, and this adorable little raffia fringe clutch (which can also be worn as a cross-body).